John Wesley (1703-1791) was the greatest preacher of the 18th century. He founded the Methodist Church. This new Christian denomination first took root in Wales, where it is credited with a national revival of faith and piety. John Wesley focused on the salvation of the poor, as well as on Christian Charity towards them. 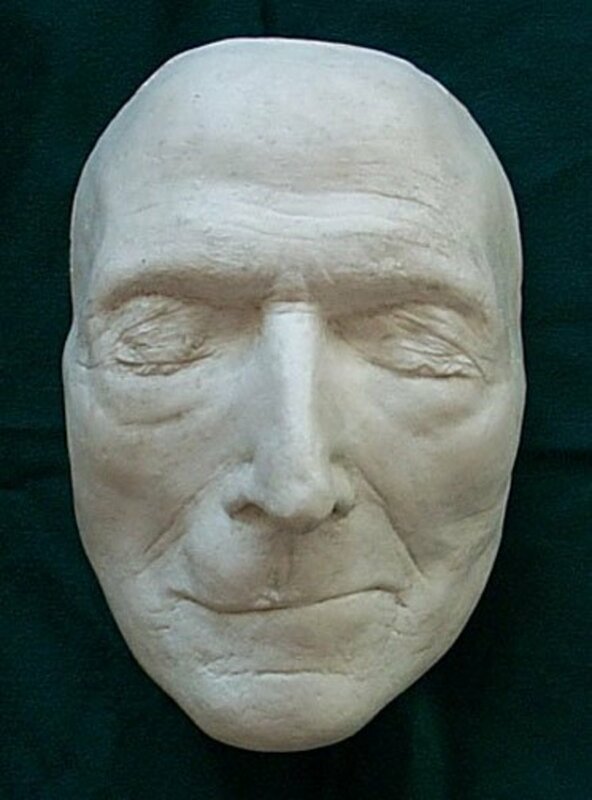 When he died, he was known as "The best loved man in England." John Wesley was the son of Samuel and Susanna Wesley, and one of nineteen children. Susanna was the last of twenty-five children born to her pastor father and his wife. When John Wesley was five years old he was miraculously saved from his burning home. He always felt that God had saved him for a purpose of His. Later in life, Wesley began to see the burning house as representative of the world perishing—with lost souls inside that needed to be rescued. In 1738, John Wesley, now a thirty-five year old Anglican minister, had a spiritual awakening after re-reading the Epistle to the Romans by St Paul, along with a preface by Martin Luther. He realized that true religion is seated in the heart. Wesley wrote: "The real nature of true religion did not consist in orthodox or right opinions, but deeper still, even in the hidden man of the heart." John Wesley sought holiness of heart and correctness of outward deportment. The connecting link between the individual soul and God is genuine personal living faith. The Holy Spirit only confers wisdom on those who no longer live for themselves. God's law extends beyond actions to words and thoughts. Grace will be manifested in obedience. John Wesley believed he was appointed by God to "proclaim the glad tidings of salvation" among a Christian people who had forgotten them. 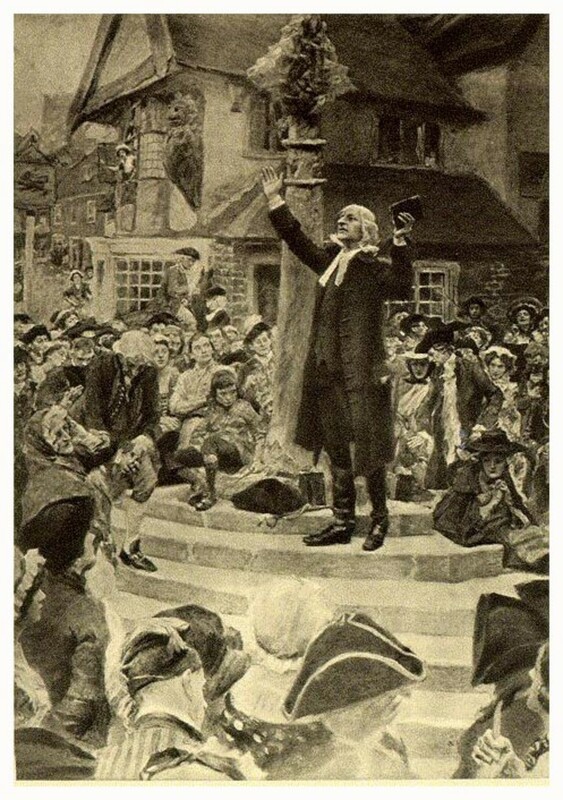 John Wesley went on tours throughout the remote sections of the British Isles to preach enthusiastically to the neglected masses. He began to preach the born-again gospel in open fields. Pandemonium broke loose at his revivals, which were complete with exorcisms, healings, and visions. He would preach several times a day no matter the weather. He drew outdoor crowds of up to 32,000 people. Nothing like this had ever been witnessed before. Wesley and his followers were sometimes beaten by mobs and bombarded with stones, bricks, and fruit. Apparently some took umbrage at his message of sin and salvation. And not just Wesley, John Smythe, "the Conjurer," was the most mobbed Methodist in Ireland and eventually murdered. William Seward was blinded and then torn to pieces by a mob in Hay. Methodist preaching houses were pulled down in many cities of England. "I had long before observed the great seriousness of their behavior. Of their humility they had given a continual proof, by performing those servile offices for the other passengers which none of the English would undertake; for which they desired and would receive no pay, saying it was good for their proud hearts, and their loving savior had done more for them. And every day had given them occasion of showing a meekness which no injury could move. If they were pushed, struck, or thrown about, they rose again and went away; but no complaint was found in their mouth." 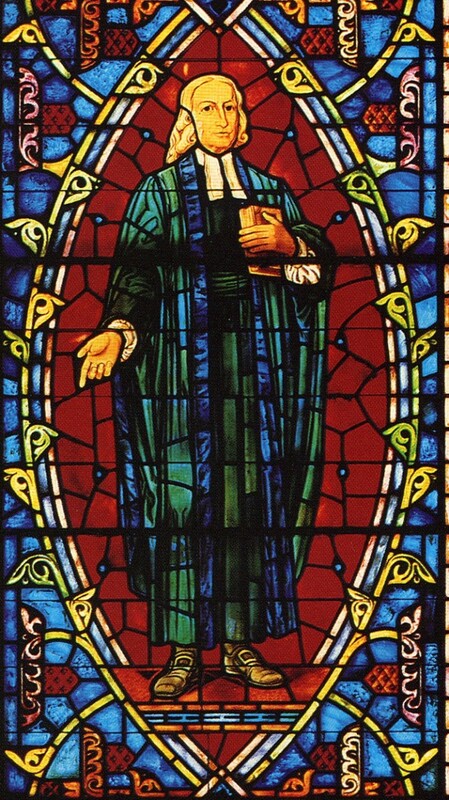 John Wesley first brought his gospel message to America in Georgia. He taught the poor how to help themselves; he preached charity, piety, and literacy. 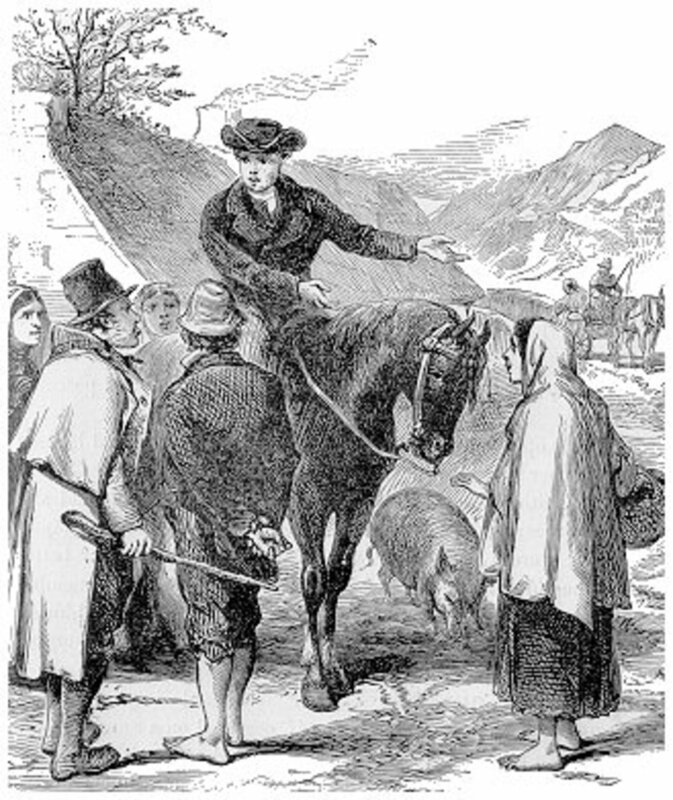 Anglican bishops were not pleased with Wesley's call for missionaries to come to America; to ride through the backcountry and preach in fields. 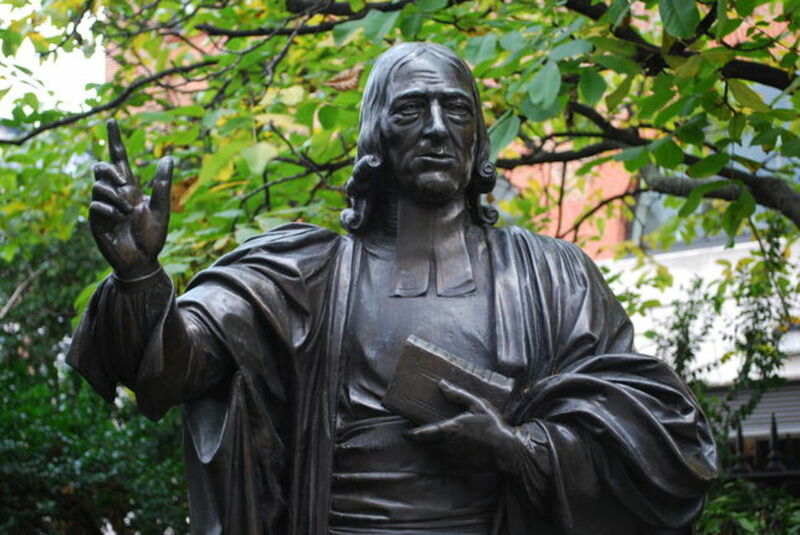 John Wesley spoke out against the evils of slavery: "Liberty is the right of every human creature, as soon as he breathes the vital air; and no human law can deprive him of that right which he derives from the law of nature." John Wesley did not buy into the Calvinist view of the "elect." 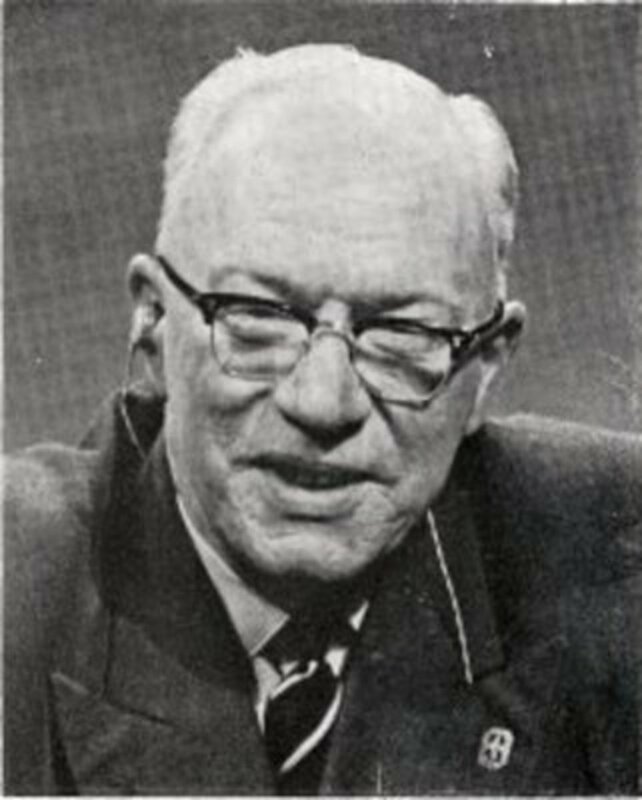 He was an Arminian, and believed that "God willeth all men to be saved." Nonetheless, he had many Calvinist friends and saw no reason why doctrinal differences should impede friendship or working together for the good of the Kingdom of God. It was Wesley who coined the phrase "agree to disagree." 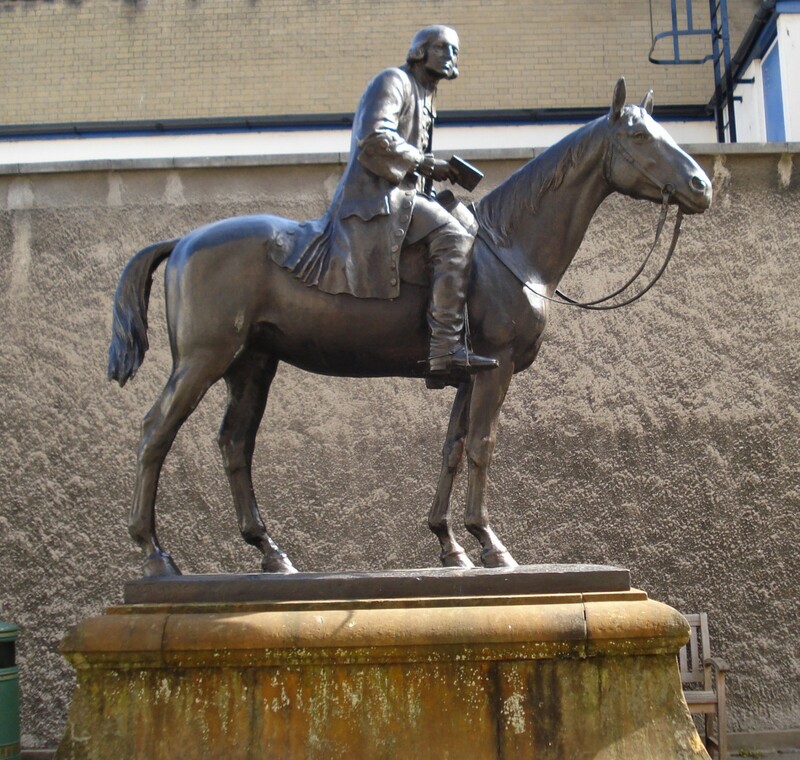 John Wesley, even in his sixties, rode 3,000 miles a year on horseback to preach 800 sermons. In his lifetime, he traveled 250,000 miles on horseback and preached more than 40,000 sermons, some of which were three hours long. John Wesley was effective. After his revivals whole towns relinquished drunkenness and violence in favor of singing hymns and studying the Bible. His appeal was especially strong with skilled artisans and small merchants. John Wesley is the "father of the religious paperback." He published 5,000 sermons, tracts, and pamphlets. These writings brought in a large income, but he continued to live on an average workman's wage of thirty pounds a year. Wesley lived frugally, and gave away over 75,000 pounds of his income to spread the gospel. His brother, Charles Wesley (1707-1788), would become one of the greatest hymn writers of all time, having written almost 8,000 hymns. John Wesley defined the Church this way: "a body of men compacted together in order, first, to save each his soul, then to assist each other in working out their salvation." "I fear, wherever riches have increased, the essence of religion has decreased in the same proportion. For religion must necessarily produce both industry and frugality, and these cannot but produce riches. But as riches increase, so will the love of the world in all its branches. For the Methodists in every place grow diligent and frugal; consequently they increase in goods. Hence they proportionately increase in pride, anger, in the desire of the flesh, the desire of the eyes, and the pride of life. 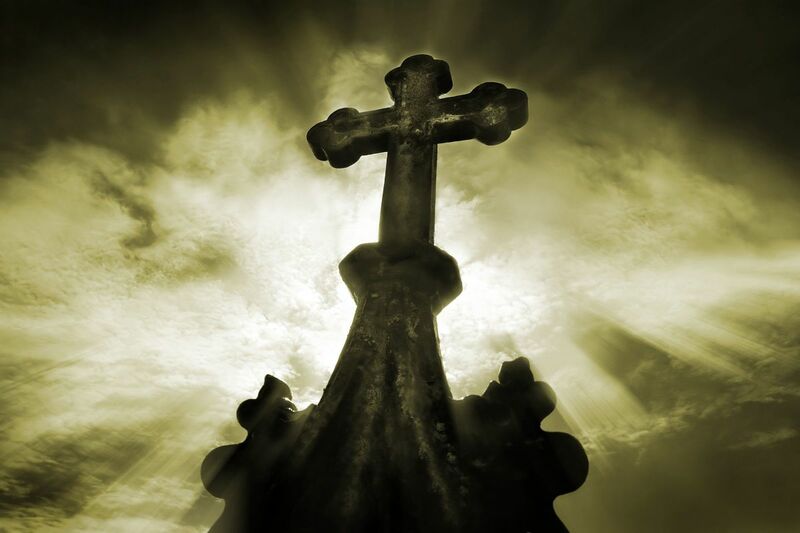 So, although the form of religion remains, the spirit as swiftly vanishes away." 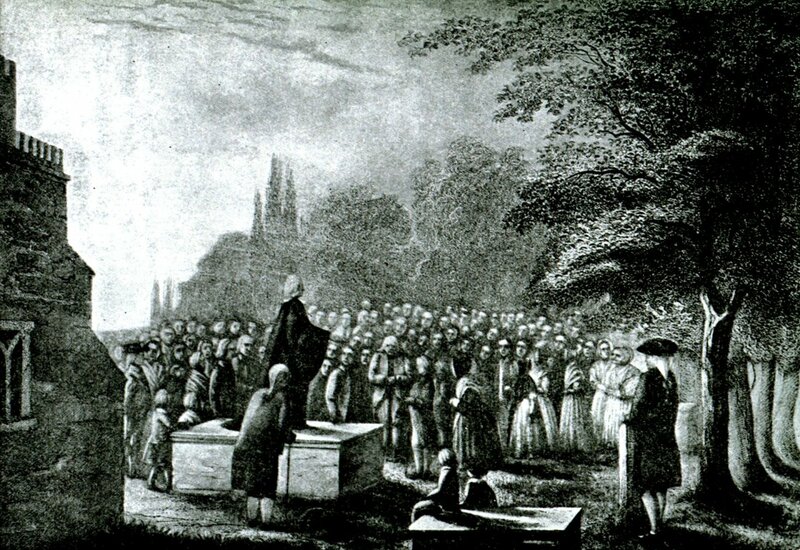 In 1744, John Wesley held the first Methodist Conference. He produced regulations about clothes, ornamentation, money, business, language, charity, and Bible meetings. Offenders were to be excommunicated. The hierarchy of the Anglican Church disapproved of all of this. The Methodists often divided families. 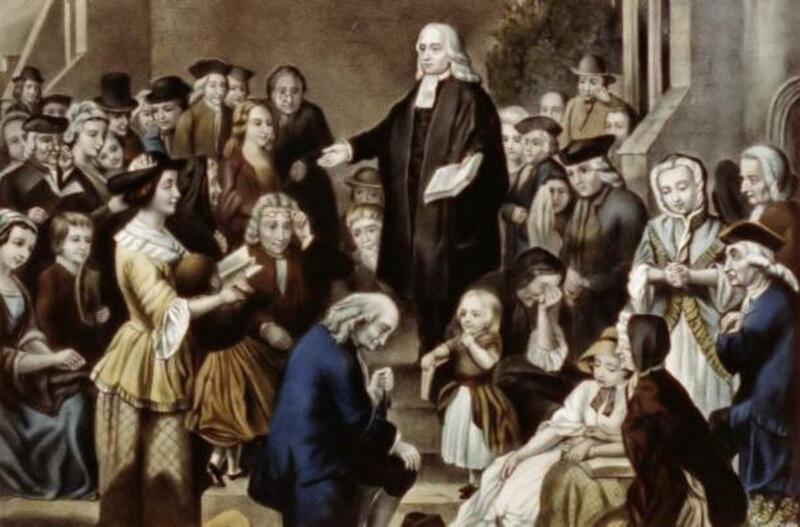 John Wesley preached against antinomianism, a teaching of modern educators that there is no unchangeable divine law as the standard of right, but that the standard of morality is indicated by society itself, and has been constantly subject to change. "I may not bring Scripture down to your taste," Wesley said. John Wesley considered himself an Anglican to the end. He never wanted Methodists to split from the Anglican Church. His sermons endorsed the existing order of society. Wesley urged his converts to obey all laws; to be content with economic and political conditions. Methodism remained inside the Anglican Church until 1791 when it officially split off and the Methodist Church was born. There numbered 500,000 Methodists when John Wesley left this world. They were and are heavily involved with charitable missions. 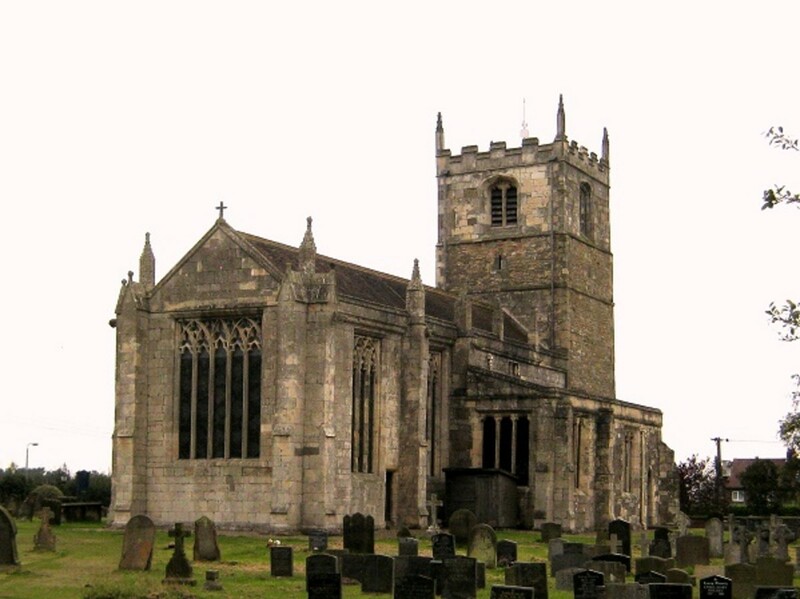 After the Methodist Church was firmly established, it built grand houses of worship and abandoned itinerant preaching. Through the tireless labors of John Wesley, multitudes have been lifted up from the ruin and degradation of sin to a higher and purer life. John Wesley was an exemplar of faith and humility, untiring zeal, self-sacrifice, and devotion as a servant of Christ. John Wesley's last words were "Farewell." When he died he left behind one well-worn coat, two teaspoons, and one Methodist Church. He was 5'3". My sources for this article include: A History of Christianity by Paul Johnson; Christian Doctrine and Modern Culture by Jaroslav Pelikan; and A Short History of Christianity by Stephen Tomkins. 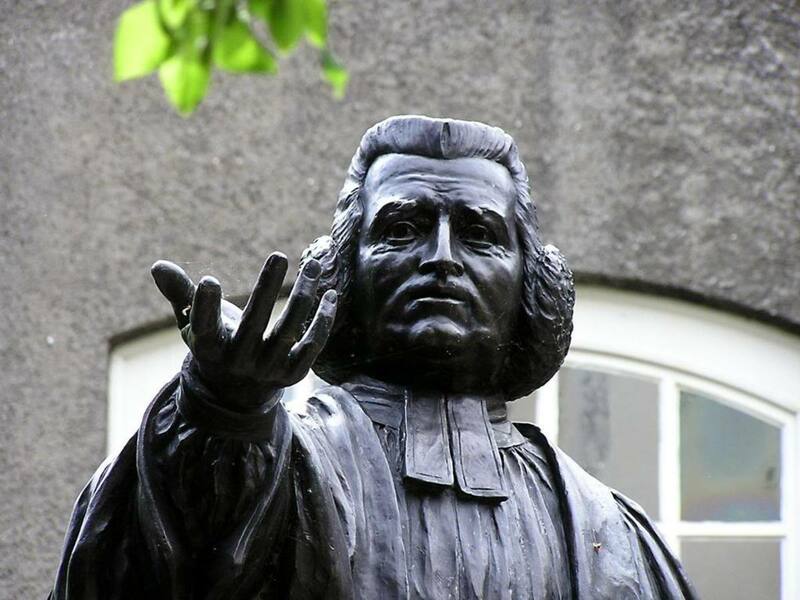 How to become a local preacher with the Methodist Church in the U.K.
Vey informative, convincing ,timeless and powerful article about John Wesley. Thanks. Your Hub article wasn’t advertised on HP this time. Perhaps you might know that, as well that you are being missed- meaning the message through your writings. I miss you brother, as well as do John Harper and Vlado Uhri who moved to the other planet. Voting for your article, up, useful and interesting. May the Lord bless and protect you always , everywhere you go. you are a wonderful writer and you put in details that make ur hubs simply sensational. PegCole17— Crowds of that size surely represented an acoustic challenge. I imagine he had to stand upwind. I cannot imagine riding day after day cross country on horseback for years upon years. He had to be saddle sore. An exceptional Christian Man? You bet. Most Methodist churches do have fine choirs. I attended one for a few years. I have also been to churches that didn't believe in musical instruments. To each they's own, I always say. Thank you for the visit and your comments. Hi James - What an exceptional Christian this man must have been. To think of the travels he made on horseback and the crowds he drew in those days. Can you imagine the acoustical challenges of speaking to a crowd of 32,000 without electronics? This is a great article with interesting facts that despite being a Methodist for a few years, I never knew. But they really did have a great choir! Tony L Smith— Thank you for the compliment and blessings. I am glad you love this subject matter. Welcome to the Hub Pages Community! wba108@yahoo.com— Yes indeed: antinomianism has always been lurking around. When we let the Devil ride along with us, he's gonna wanna to drive eventually. I agree with you that it is in the heart where God needs to live. And faith without works is dead. Thank you for reading my stuff and leaving such nice compliments for me to read. God Bless You! Joshua Kell— You are most welcome, Brother. I humbly accept your gracious accolades. It means much coming from a discerning man such as yourself. God Bless You! Thank you for coming to see me. olgakhumlo— Thank you for reading my article. I am glad you enjoyed it. Yes, we are all to be faithful evangelists. That is an outstanding comment!! God Bless You! Polly— You're welcome. Thank you for coming back with that puzzling story. A sin to drink soda? That is a new one on me. I have never heard of such a thing. Bizarre. I see that the popularly of the idea of evolving morals has been around for a while and today threatens to undermine our morals and legal opinions. I like his insight that true religion is a thing of the heart and not a matter of stuffing your head with knowledge. biblical knowledge and understanding always should lead to an experience with God because if it doesn't it just makes us more religious or legalistic. He also makes the point that your beliefs must translate into actions because it takes no faith to acquire head knowledge for its own sake. Beautiful article, keep up the good work, God bless! Thanks James. I do love Wesley's work. I have read of the early Methodist movement, and it was amazing!. It is a shame when a movement turns into a system though. Thanks. AMAZING!!! It reminds us that we too ought to be faithful evangelists .A mother's prayers that strengthened him to obey God's commission.I enjoyed reading it .God bless you. lilyfly— You are most welcome, lilyfly. Thank you very much for coming by to visit with me. gracenotes— Thank you for taking the time to come over and read my Hub about John Wesley. As you say, one of the first street preachers. I appreciate your kind compliments. There is much to like about a big, beautiful Methodist church. Their worldly views leave much to be desired for me personally. Great choir, though, as you say. You are right that many Methodists have discarded the Virgin Birth. They must at all times be modern, or "with it." It sounds to me like you've got a great and learned man of God as your pastor. That is a blessing, to be sure. activation123— Thank you very much! Welcome to the Hub Pages Community! "a man who defined dedication by example as opposed to just words"
Thank you for coming by to visit, WB. I always enjoy reading your comments. CMerritt— You are welcome, my friend. It is mind boggling indeed. I absolutely love that quote by Wesley. I don't know how I missed that. Thank you for adding it. Hello, hello,— You are most welcome. Thank you very much for reading my work and leaving your comments. searchinsany— I am thinking I should get a copy of John Wesley's Explanatory notes after reading your endorsement of them. I am not familiar with Adam Clarke, but I appreciate you mentioning him. Thank you for your excellent comments. Welcome to the Hub Pages Community! I didn't want to say anything earlier but since we are telling tales,(lol) my father-in-law's brother was a Methodist preacher and he and some friends came to visit one summer or maybe it was his family and it was against church rules to drink sodas, so next time he came back my father-in-law didn't serve them any sodas but they said it was OK now they could have sodas. That does sound strange for a Christian church and I know many here at HP have no idea about the word of God who claim to be Christian and give real Christians a bad time, well they think they are. If they knew the bible they would be trembling in fear for their actions. Thanks for great discussions with meaning. Interesting Hub James. Keep up the good work. A good hub about one of the heroes of the faith. I have the utmost respect for John Wesley, and so, I appreciate getting the chance to read your hub. Wesley was one of the first street preachers! While I was married, my husband wanted to attend the Methodist church, so that's where we went. And it just so happened that 2003 was the 300th anniversary of Wesley's birth, so the church had a special emphasis on him during that time. John Wesley apparently did not enjoy a happy marriage, and that makes me appreciate him, in his humanness, all the more. By the way, I could not stay in the Methodist church, even though there were some things I really liked about it. For instance, I am a singer, and I've never sung in a better choir than the one we had. But, in order to be fed from God's Word, I had to make my way out of there. As for the Apostle's Creed, we still recited it in our Methodist church. Knowing some of the church members as I did, I think the real objection was that the creed starts with the words, "I believe in God the Father Almighty, the Creator of Heaven in Earth" and some folks just don't like to admit that God is our Father and also the father of Jesus Christ. You see, these misguided folks imagine that God should only be referenced as a Creator or even a "she", and therefore, with this heretical notion, they have, effectively, come to the conclusion that Jesus was not born of a virgin, and instead probably had a human father. When one of the women in my church got married, she asked the officiant if he "could include inclusive language" in the marriage vows and in everything that was said during the ceremony. Alas. By the way, my current pastor is often wont to refer to the writings of Luther, Calvin, and Spurgeon in his sermons, never to John Wesley. But my pastor's favorite hymn is also "And Can It Be?" which was written by Charles Wesley (it's also become my favorite hymn!). no body— I am glad to hear that some of the backslid churches have repented. That is fantastic news!! I have been to Methodist churches that were more like a social gathering than a church. And you surely would not hear a word about sin, or hell, or the Devil there. 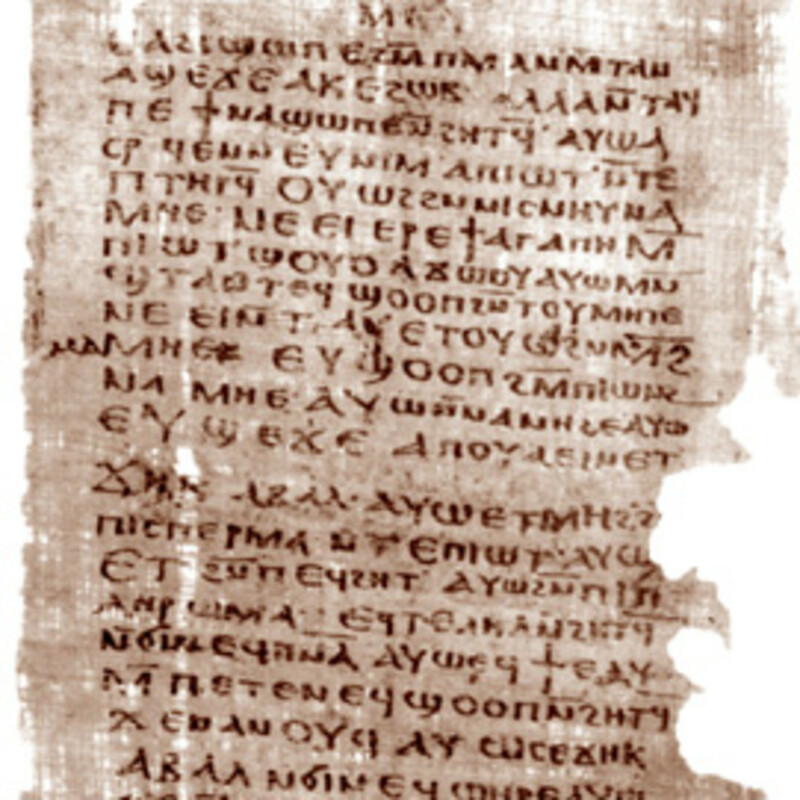 At one a petition was signed to stop making them recite the Apostle's Creed because they don't believe in it. God Bless You Brother Bob!! einron— You are welcome. I surely appreciate you forwarding my article to the Old Boys Assn. I enjoyed reading your comments. I always enjoy hearing your voice. Thank you for coming! 2besure— I am glad that you and your husband liked my work. Thank you for letting me know. I appreciate the visit and your comments. crystolite— You are very welcome. Thank you for taking the time to read my Hubs. I'll come by to read yours too ASAP. CMHypno— You are welcome. I am well pleased to have provided an introduction to John Wesley. He was quite a man. Thank you for visiting and commenting. DeBorrah K. Ogans— You are welcome, Sister. I appreciate your gracious compliments and warm words. John Wesley was indeed a brilliant man of God. I agree with you that the Scripture you mentioned was manifested in the heart of John Wesley. And yes, as you say, he did receive a powerful revelation from God. You have a way of seeing right to the heart of the matter. I love that about you. Thank you for coming to read my Hub and offering your insights. cristina327— You are quite welcome. Thank you for such lovely remarks. I savored them. I highly esteem John Wesley, too. As you say, he turned 18th century England upside down—for the better. I appreciate your compliments and blessings. Always good to hear from you. stars439— Thank you brother! Thank you very much. God Bless You! Polly— You are welcome. Thank you for reading my Hub. I appreciate your always excellent remarks. I attended a Methodist church for a few years, but one that had gone way liberal. Many no longer believed in the Resurrection! One day, on the elevator to Sunday School shortly after I started going there, I heard a woman behind me whisper to her friend, "The guy with the Bible is here!" It was only then I realized that I was the only one with a Bible. I wanted to quit early on but God told me to keep going to combat heresy—which I did. Docmo— You are welcome. Thank you for the kind compliments. I am well pleased that you enjoyed this article. I appreciate you letting me know. Welcome to the Hub Pages Community! Thanks AGAIN James....it is always a pleasure to read your hubs. sherrylou57— I am glad you loved this Hub. John Wesley preached a message to the poor of helping themselves up out of poverty—and it worked! Tamarajo— Thank you for your encouragement. I enjoyed putting this Hub together. I appreciate the visitation. Partisan Patriot— You are welcome. Thank you for taking the time to read my Hub and leave your comments. Loves To Read— Good to see you, my dear. I appreciate the up and useful, as well as your gracious accolades. I agree with your comments. Peace and Blessings to you! Thank you, James, for doing all this research. Great information of which I didn't know a lot. Not only is this a well researched and written Hub, it is totally inspiring and unlifting. I have found in recent years that during my study times I now constantly refer to John Wesley's Explanatory Notes for his input. In my opinion it is a miracle that he managed to pack so much into his lifetime. I doubt if he spent much time on the golf course! ps. I also find Adam Clarke's Commentary of the Bible a great source of information, (another 'Methodist'). Both Commentaries are available free on e-Sword. So many good Methodist Churches. Some recently have done flips from liberal back into salvation preaching and I have done a warwhoop of victory. Love to hear when a preacher follows the way to heaven instead of just what a committee says and forsakes the way. I know of many many people that were saved out of the Methodist denomination but by the pastor out of the scheduled service. I attended a Methodist church off and on for a time. I never once heard the gospel there or of any that took the time to tell anyone. But then down the road one will go back to the traditional salvation preaching and down the road a little farther and a Methodist church never left the salvation message. God does use churches under the name to get a lot of folks home to Him. Thanks James. My father and I were teachers in the Methodist Boys School (Secondary). I thought that John Wesley was an American until recently because the principals were Americans. Recently, my former students contacted me on Facebook. They have formed an Old Boys Assn. and I shall send your article to them. I am sure they would love to read about John Wesley. You have done an excellent job on John Wesley. My husband is quite versed on Christian history and also enjoyed your hub and learned a few things. Thank you so much for enlightening me about John Wesley. I have been hearing that he is a grate preacher but did not get the full information. Vote you! Thanks for all the great information on John Wesley, James. Having been brought up a Catholic, we were never taught about Methodism and certainly were not encouraged to read any of his writings! He was given a powerful God inspired revelation! : “"the real nature of true religion did not consist in orthodox or right opinions, but deeper still, even in the hidden man of the heart." Amen! As the Word of God says “This is the covenant I will make with them after that time, says the Lord. I will put my laws in their heart and I will write them on their minds.” Hebrews 10. We are able to bear witness here that this marvelous Scripture surely manifested in the heart of John Wesley. Thank you for once again bringing us an interesting, informative and educational treatise! Well done Professor! In HIS Love, Grace, Joy, Peace & Blessings! Excellent hub which features the interesting biography of a great man of God. I will always esteem John Wesley highly as the man used by God to turn England upside down in the eighteenth century. He is one man who has truly impacted the world. Thank you for sharing this beautiful life account. Remain blessed always. Best regards. Wonderful interesting hub. Fantastic work. God Bless You. What a remarkable man John Wesley was! 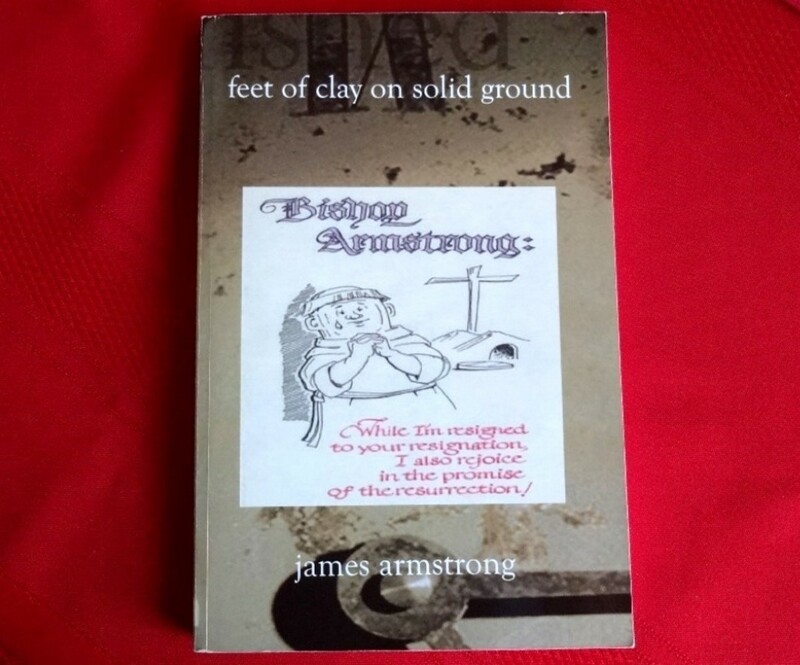 Thank you, James, for bringing us this fascinating retelling of who he was and what he believed. He may not have been tall in stature at 5'3 but his legacy was enormous. I didn't know he was one of 19 siblings and his mother had 24 siblings. Interesting details. You know I have never been in a Methodist church and this might lead me to do just that. I have often heard they are somewhat like the Holiness church which I was saved and baptized in although all these years I have only gone to Baptist. I have long missed the power and spirit I witnessed and felt as a child. A wonderful story, thank you. This is amazing piece of history on an amazing man. There's so much rich info here, James, thanks for sharing. Enjoyed reading this. voted up! It was amazing how large the families were in those days. Another inspired and interesting Hub. - Thanks. aguasilver— Yes, I know. He was terribly disappointed by his experience in Georgia with Oglethorpe. Thank you for your illuminating comments. It is always such a pleasure to hear from you, John. And I agree: he would not be pleased. Love the hub, nice that he preached to the poor, because sometimes the poor do not want to get up and do something about it! zzron— You are quite welcome. Thank you for your kind accolades. I appreciate the visitation by you. Wealthmadehealthy— I surely agree with you. John Wesley did change the world. And one like him can do it again. Thank you for your thoughts. "True religion is seated in the heart"
"The connecting link between the individual soul and God is genuine personal living faith"
He made an interesting observation about how wealth and abundance can sometimes affect a spiritual life. Interesting article. he was even a missionary to America. Vladimir! You are welcome! I love John Wesley too, brother. I am grateful for your presence here. God Bless You! Joni Douglas— I can't imagine it either. What grit! What resolve. I agree with you that his ideas on individual liberty surely resonated throughout the colonies. Thank you for coming by and offering your gracious compliments. Brenda Durham— Thank you for being my first visitor! And you are welcome. I very much appreciate your accolades and the voted up! Yes agreeing to disagree is an excellent course of action. 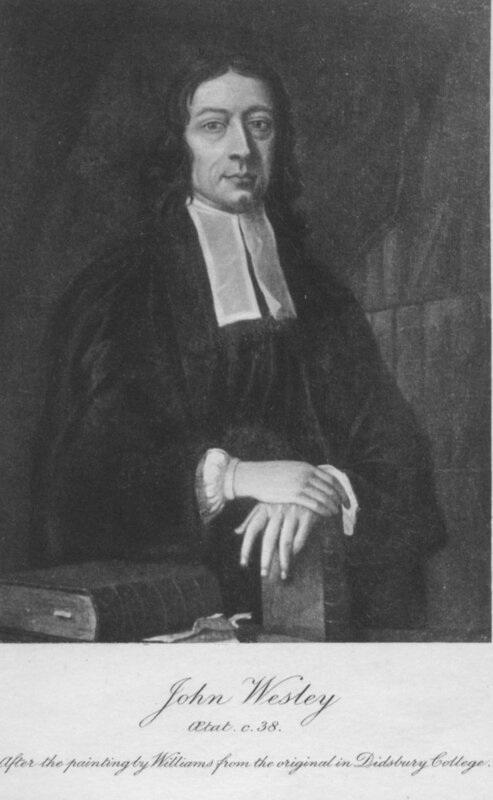 As John Wesley rightly believed, there is no need for animosity over mere doctrinal disputes that are of no real consequence. Yep. Wesley was a prolific circuit rider. Amazing! 250,000 miles in the saddle. Imagine. God Bless your brother. And you. Thanks for yet another history lesson James. Before this I was unaware of the Methodist roots in this country. enlighten us all with your writing. We certainly could use more John Wesleys in the world today. Up and useful. Ironically he was basically run out of America when he first went there, and admitted himself that he was 'scarcely saved' when he started preaching. I read his book, an old copy that a friend lent me, and it was revealing to say the least. He never called his movement `Methodists' it was the public that started the name rolling, from their modus operandi of first building a school in any area they founded a fellowship, and each member of the fellowship was required to pay into the building fund. He would be dismayed to see what they became! Good hub! Lots of information! Awesome post brother! Thanks for the history lesson James. James. we need another John Wesley to stand up again. The teaching he would give just might change the world as we know it. Wonderful piece. I love John Wesley and thanks James for this Hub. A fascinating read. Well done James. His individual liberty thoughts obviously took root in America. I can't imagine living the life that this man led. This is good information that I'm rather ashamed to say I've never looked into in-depth myself! I have a brother who's a Methodist Pastor in another State. Voted your hub UP; you are great as always!